Sports Illustrated has put together a list of the 101 greatest players by jersey number. According to their website, they based their decision on a combination of factors, including the player’s impact on the game, statistics and his team’s success during the time he wore the number. 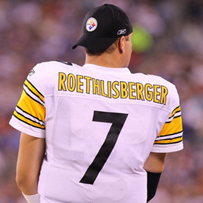 John Elway took the honors for #7, however, the runner up? You can read his full mailbag here. — Ben spoke with the media after practice this afternoon, you can watch the video here. — I have added a few new photos from both pre-season games here.